The 44 acre lieu-dit known as Aupilhac is a renowned, fully biodynamic certified property located in the enclave of Montpeyroux just across the river Hérault from Daumas Gassac and Grange des Pères. Though five generations have farmed these choice vineyards, it was Sylvain Fadat that brought the estate its acclaim. Not one to shy away from hard work, Sylvain cultivates vines on steep, extremely rocky terrain, and has even terraced much of the land himself – an enormous financial investment and back-breaking work but necessary in this case to reveal a great terroir. 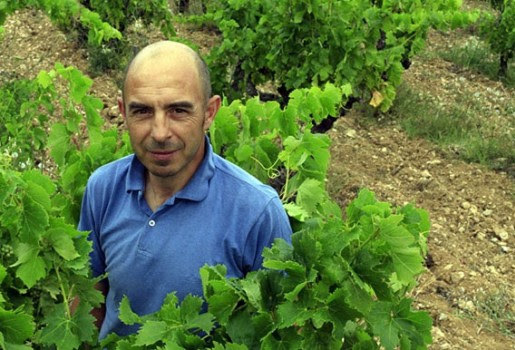 Sylvain believes that effort in the vineyard has the most influence on the quality of his wine. He coaxes old vines to root deep into soils of limestone, clay, scree, and blue marl. The grapes are harvested by hand and only indigenous yeasts are used. The wines are bottled unfiltered in accordance with the lunar cycle and optimal atmospheric pressure. It’s the meticulous attention to each and every one of the small details that result in wines of great expression. The cuvée “La Boda” gets its name from the Spanish word for marriage. The blend is a union of terroirs: 45% Syrah comes from the north-west facing vineyard of “Les Cocalières” that is situated at an altitude of some 1,150 feet and rich in prehistoric oyster fossil deposits, which lend an incredible length and minerality to the wine. The remaining 45% Mourvèdre and 10% Carignan come from the Aupilhac vineyards on south-west facing hillside terraces. Long maceration with regular pump-overs and aging for 24 months in 300-liter barrels helps create this deep, rich, and vibrant wine. It practically fills the room with its fragrant notes of ripe blueberries and blackberries, garden herbs and crushed stone. A sip is simultaneously ripe and electric, filled with pure fruit balanced by a marathon finish. While the wine has the structure to develop in the cellar it is an absolute stunning drink right now. It stands to reason that some of the best inexpensive wines are the ones made by winemakers who know how to make great wines. With all the characteristics of a quality Languedoc wine “Lou Maset” is made in a style that emphasizes its fresh fruit. It’s an ideal bottle for those busy weeknights when dinner consists of a quick cheese platter or even pizza. A blend of 40% Grenache, 40% Cinsault, 10% Mourvèdre, and 10% Carignan, vinification is done traditionally in stainless steel vats and the wine is aged a further six months in neutral barrels. Formerly the most widely planted grape in France, and quite often overproduced, Carignan doesn’t have the best reputation. Generally, it’s high levels of tannins and acidity work best as a small proportion of a blend. But gifted vigneron like Sylvain Fadat know that very old Carignan vines that are managed artfully are capable of producing the concentrated ripe fruit needed for a wine of great significance. From the beginning, Sylvain has tirelessly defended Carignan as the “origin, history, and essence of the region.” So much so that he has declassified “Le Carignan” from the Languedoc Montpeyroux appellation (which requires no grape variety be more than 70% of a blend) to the more general Mont Baudile IGP, just so that he could bottle this superb fruit on its own. The result is a wine of concentrated dark fruit that’s never heavy on the palate, with ripe tannins on the finish and a final twist of freshness at the close. Above the elegant textures are a grocery basket of sumptuous aromatics: blueberry and red currants, moist earth, and the Languedoc shrubland (garrigue) that comes across as just the slightest hint of rosemary. While drinking beautifully now, this is a wine of longevity – reports have the 1989 vintage (Sylvain’s first) still drinking nicely.